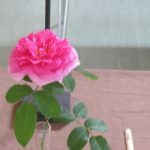 After a day of heavy rain the heatwave commenced again a week before Horsham Horticultural Society was due to hold its annual Flower, Fruit and Vegetable Show on the 4th August. This is traditionally a critical week for members wanting to show their exhibits in premium condition. However water butts were filled and together with clever gardening techniques the members put on a show to be proud of. An extra point of interest this year was the inclusion of Holbrook Primary School displaying hanging baskets for the Junior Section. Seven entries were submitted, all to a very high standard. The children had assembled the baskets from flowers grown at school and then cared for at home after term finished. At 3.30pm the pupils who were able to be present were awarded prizes and a ‘Works’ gift token was given to the first place winner, Paignton. 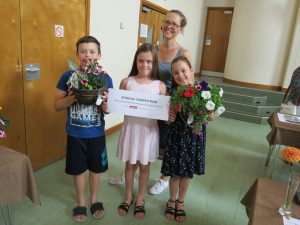 Wilkinsons Stores sponsored the event in the form of a gift token to be spent on seeds and the hanging baskets were supplied by Horsham Horticultural Society. The society worked closely with teacher Harriet Mayo from Holbrook School who entered into the spirit of the initiative with much enthusiasm and also arrived on Saturday to support the event. The Chairman’s ‘Old Boot’ competition inspired 8 members to fill an old boot with plants and/or flowers grown themselves or purchased. 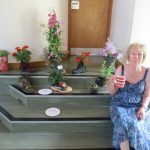 Val Hardwick’s boot was awarded 1st place with a large wellington boot filled to capacity with flowers and foliage, 2nd place went to Carol Treharne and 3rd to Barbara Jessett. The event which showed great flair and imagination was judged by Ron Thomas, professional judge, who also judged the flower, fruit and vegetable classes. An outstanding plant in the pot plant section was displayed by Alison Best- Dufour who staged a Pineapple Lily (Eucomis). This 1st place winning entry was grown from a bulb which Alison won in the raffle at one of the winter meetings run by the horticultural society. 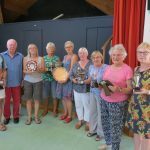 The Photographic Section was well supported this year and the trophy for overall winner was presented to Sally Birchmore for gaining most points in this section. This competition will be staged at the Spring Show next year to allow extra space in the hall for the summer exhibits. Most of the trophies were won again by Sue Hammond who puts a phenomenal amount of entries in from year round work for the show. From the Domestic Section through to flower, fruit and vegetables Sue is our enthusiastic Show Secretary and a worthy winner. The Chairman thanked the President of the society, Mr Bob Taylor, for presenting the trophies and also the dedicated committee along with its supporters, for all the hard work which went into making the day a success. Refreshments were served by Eileen Sendall, Rita Ginn and Alison Best-Dufour who worked extremely hard in a very hot kitchen for most of the afternoon. Also thanked were the members who entered the show and the visitors who just came along to view and enjoy the tea and cakes. The winter meetings commence on October 4th when we have an exciting programme lined up until March. Entry for visitors and guests at the meetings is £2 to include refreshments. alternate Tuesdays 7.30pm – 9.30pm. Visitors and guests very welcome.